El Numero 8 is an accommodation that was designed by and for responsible travellers. Being travellers ourselves we decided to create a space that would exemplify what we are looking for when we are out on the road. An authentic place to stay that is tranquil, in a picturesque setting, clean, with reasonable prices, and aware of the environment and its fragility. That is what we try to offer here. 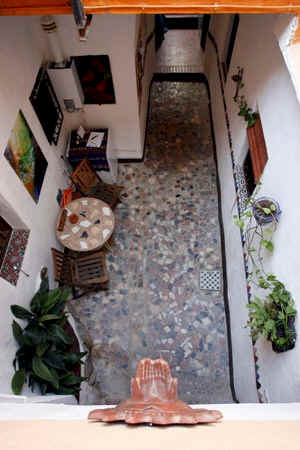 El Ocho is a very old house typical to one of the oldest neighborhoods in Europe, the Albayzin of Granada. We have maintained the original structure of the house that was separated into independent spaces surrounding an interior patio, and which share a rooftop terrace with great views of the Alhambra. Each of the independent spaces is a self-catered apartment that we have reformed to offer modern comforts without losing the essence of the original space itself. 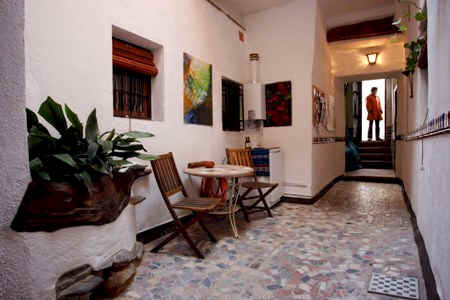 We are a small accommodation with 5 apartments in total and in one of them live the Innkeepers, ourselves. Our prices are not set relative to the other prices in the area but are relative to what we need in order to cover our expenses and leave us money to keep traveling and support our other environmental and musically oriented projects like www.wapapura.blogspot.com. 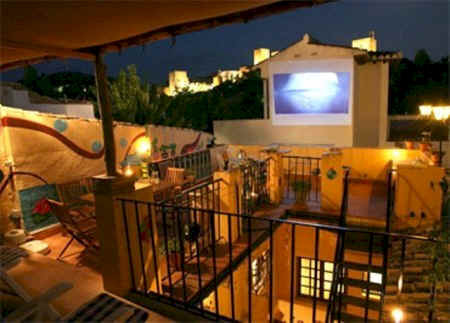 We also offer film sessions on the terrace where guests can mingle with our neighbours to share a wonderful night watching a movie with the Alhambra in the background. accommodation: The house has 4 self catered apartments available. Three of them can fit up to 4 people and one of them can fit two people max. Each apartment varies in its size, layout, design and decor, and has a fully equipped kitchen, a bedroom, living room and bathroom. They all have Radio/CD players and have access to all the common areas in the house including the rooftop terrace. All linen is included in price. To minimize our impact on the environment we only clean linen on check out or with guest’s request. We dry all the linen on lines in the sun to save on using the electricity for a dryer. We are encourage our guests to be aware of water and electricity resources and consumption. As they are self catered apartments there is no maid service during your stay. All the apartments have power saving radiators to offer a nice clean heat in winter, power saving light bulbs, water saving toilets, and recycling stations to help us recycle the rubbish brought in during your stay. There is no need for air conditioning in the summer as the apartments stay naturally cool due to the traditional Moorish architecture style. There are fans in the apartments but they are usually not necessary. The office of El Ocho is run on solar power as well as the free WiFi service we offer to all guests. surroundings: There is a rooftop terrace that has splendid views of the Alhambra. From here you can hear the birds from the surrounding gardens and music wafting through the air. The neighborhood in which El 8 is situated offers endless cobblestone streets to explore, plazas to sit at, and cafes and bars to linger at for hours, watching life go by at a different pace. And if you are looking for more places to walk, you only have to go out to the Sacromonte, the cave area neighbouring us, and if you keep walking you can end up in the mountains that surround Granada where the trails go on into the Sierra Nevada National Park. 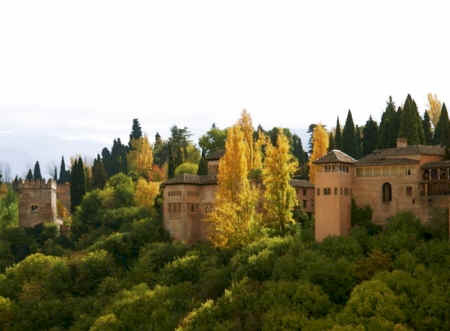 Besides all of this there is of course the Alhambra Palace and all the other historic monuments famous to Granada . location: El 8 is located in the Albayzin, an historic pedestrian neighborhood which is the traditional downtown of Granada . Granada, the more modern European city, sits just below us only a few minutes walk away. It is recommended not to think about driving at all when in Granada. Most of this area and most of central Granada is pedestrian. The airport to Granada is about 30 minutes by bus. The coast is approximately an hour away. The Sierra Nevada ski slopes and hiking trails are approximately 40 minutes away.The beautiful white villages of the Alpujarras are just over an hour away. Prices: Our prices remain the same all year round. We do not see it necessary to vary our prices with respect to when people might have the chance to travel. changeover day: Check out at 1130am. We have an arrival procedure to get to the house which includes a pick up process. There are three times you can choose for this pick up: 1-2pm / 5-530pm / 7-730pm. Other times can be available on request. Much more detail on the arrival process is on the website.